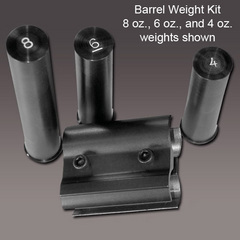 Easy to install, kit includes a barrell clamp with three different weights to choose from. The 4 oz., 6oz. and 8oz. weights are ploished and blued steel. The clamp is lined with a non slip tape to protect the barrel. The kit also includes 2 adapters to fit the unit to 20, 28 and .410 gauges.